The Anglesey Antiquarian Society first published Copper Mountain in 1966 as the first publication in the series Studies in Anglesey History. 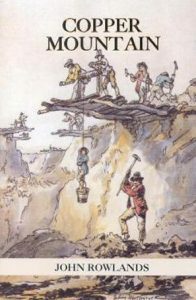 The book has been out of print for some time and Stone Science has undertaken to reprint the book as the first of a series of re-issues. Certain changes have been made from earlier editions. These include colour pictures and an amended family tree. John Rowlands, a native of Anglesey, was educated at Holyhead County Secondary School and the University College of North Wales, Bangor. He graduated in 1952 and was awarded an M.A. degree in 1960 for a thesis on the social and economic changes in the town of Amlwch. In 1971 he was awarded an M.Ed degree for work on Comprehensive Education in Anglesey. After serving as Head of the History department at Holyhead Secondary School, he was appointed Deputy Director of Education for the Anglesey Education Committee. Following local Government re-organisation he became Deputy Director of Education for the county of Gwynedd, a post which he held until 1976 when he was appointed Headmaster of his former school. He was awarded the O.B.E. when he retired in 1987 for services to education. He is a Vice-President of the Anglesey Antiquarian Society, and a former Chairman of the Anglesey Magistrates. If you would like to order by post please use our order form available here or click on the button below if you want to order on line via PayPal.